News Corp., like many other broadcasters, wants Aereo to pay fees for retransmitting its content. News Corp. is threatening to make Fox a pay-TV channel if streaming TV startup Aereo stays in business. "We believe that Aereo is pirating our broadcast signal," News Corp. president and COO Chase Carey said in a statement. "[W]e won't just sit idle and allow our content to be actively stolen." 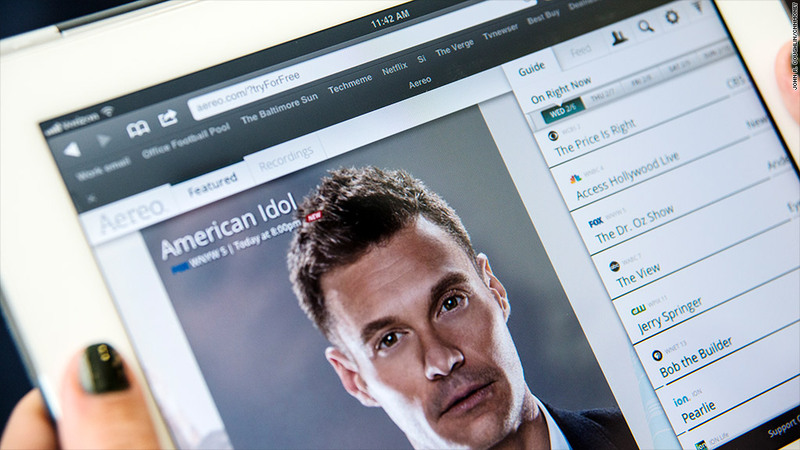 Broadcasters have tried to kill Aereo for a year, suing to put the service out of business. But a federal appeals court last week upheld a ruling that said the startup can legally allow subscribers to stream or record live broadcast TV. Networks think Aereo should have to pay them to retransmit their programming, just like its affiliates, cable companies and satellite providers do. These range from less than $1 per subscriber for some broadcast channels, to $55 for premium content like Disney's (DIS) ESPN. Aereo's defense is its technical setup: The company houses thousands of tiny antennas in its data centers, and it assigns each customer a unique antenna. People who get broadcast TV over the airwaves (which Aereo users technically do) are legally allowed to record and stream that signal digitally. Broadcasters say the antenna setup is an unfair dodge that allows Aereo to commit piracy. That's why News Corp. (NWS) is taking an "us or them" approach. It's very unlikely that the media giant would actually yank Fox from the broadcast lineup: About 10.6 million U.S. households get television exclusively over the air and would no longer be able to watch Fox if News Corp. actually made Fox a cable channel. In its bluster, News Corp. clearly wanted to make a point. The company complained that broadcasters need both advertising and subscription revenue to remain viable, and that all News Corp. wants to do is "remain in the driver's seat of our own destiny." Aereo shot back in its own statement: "It's disappointing to hear that Fox believes that consumers should not be permitted to use an antenna to access free-to-air broadcast television ... Having a television antenna is every American's right." Last July, a Manhattan federal court denied the broadcasters' request for a temporary injunction to shut Aereo down; last week, an appellate court upheld that ruling. The company is launching in 22 new U.S. cities, including Atlanta, Boston, Philadelphia, Dallas, and Houston, this year -- but it's avoiding states like California, where it may face a tougher legal climate. Aereo's big-name investors are determined to keep the startup running. That star-studded list includes Highland Capital Partners, FirstMark Capital and Barry Diller's IAC (IACI). Ironically, Diller built the Fox network from the ground up and served as its CEO until 1992.